In any first aid kit it is important to carry all of the essentials. Within this category you will find medical tapes and ace-type bandages in a variety of types to choose from. Our medical tapes are made from flexible elastic type materials that allow you to tape body parts that bend, allowing flexibility for a freshly dressed wound. Medical tapes are available in different brands and some offer waterproof features. 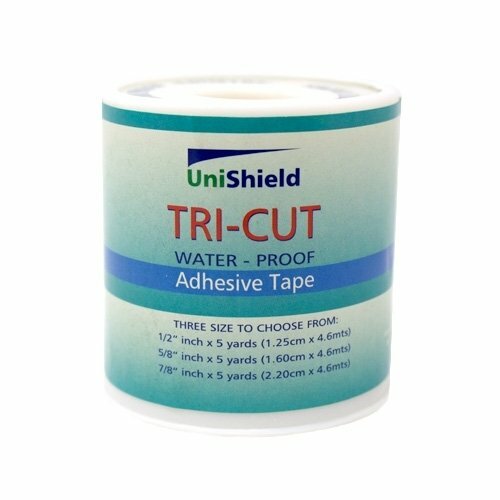 All tapes offer adhesives for easy wrapping of a wound. The common brands we stock for medical tapes are Elastikon flexible elastic tape, Ban-Tex non adhesive protective wrap, standard 1/2 inch and one inch waterproof adhesive tape, Tri-Cut adhesive medical tape (Cloth Tape) that is chemical, water and perspiration resistant. Other bandage products in this category include Medi Rip bandages with easy to tear features and Ace-Type bandages for support of strains and sprains. All of the medical supplies in this category are in stock and ready to ship. Protects hands and fingers from industrial hazards while maximizing dexterity. Non-adhesive, wear-resistant cohesive gauze. A must-have for any first aid kit, this cloth medical tape is water, chemical, and perspiration resistant. 3 widths, 5 yards each: ½”, 5/8”, & 7/8”.